A Diamond Select Toys Release! 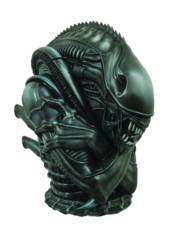 Cookie thieves mostly come out at night, mostly, so make sure your cookies are safe with this detailed ceramic cookie jar in the shape of a ferocious Alien Warrior from the sci-fi classic Aliens! Even if it doesn't instantly send thieves running from the room, no one will dare lift the jar's removable skullcap to get at the sweet, sweet cookies inside - there are way too many nasty things inside a xenomorph to take the risk! This approximately 18' tall cookie jar comes packaged in a full-color box.